Inox Wind has allotted over 9.42 million shares for Rs306 crore to anchor investors. 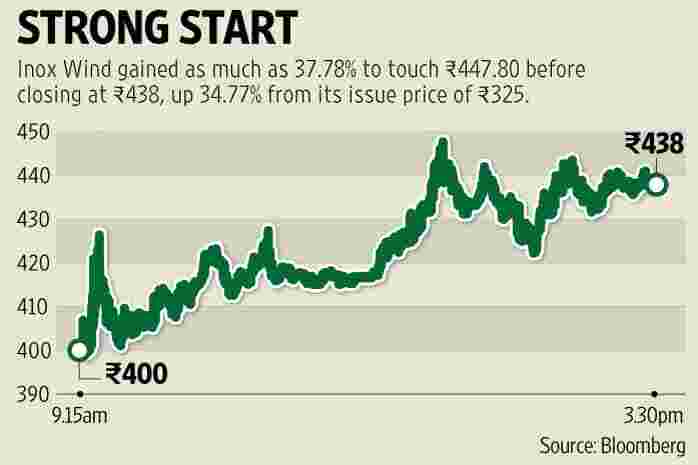 Mumbai: Shares of wind turbine manufacturer Inox Wind Ltd closed nearly 35% above issue price on Thursday on its first day as a public company. Inox Wind, which opened at ₹ 400 against the issue price of ₹ 325, gained as much as 37.78% to touch ₹ 447.80 before closing at ₹ 438, up 34.77% from its issue price. Retail investors were offered shares at ₹ 310 per share in the initial public offer (IPO), which was oversubscribed by 18 times. A market expert observed that there was appetite for issues with good potential. “If there is a stock which is in a decently growing sector, which has huge potential going ahead, then the market would opt for it," said Dipen Shah, head of private client group research at Kotak Securities Ltd. “This success does not define the trend for the primary market in the near term. It is all going to be specific to the sector and the company. The ones with huge opportunities ahead would attract more attention," Shah added. The firm raised around ₹ 700 crore in the IPO, in which its parent Gujarat Fluorochemicals Ltd offered 10 million shares for sale. The wind turbine maker allotted over 9.42 million shares for ₹ 306 crore to anchor investors. Goldman Sachs India Fund, Swiss Finance Corp. (Mauritius) Ltd, Indus India Fund (Mauritius) Ltd, IDFC Infrastructure Fund and Sundaram Mutual Fund A/C Sundaram Equity Multiplier are among the anchor investors. Inox Wind manufactures wind turbine generators (WTG) and provides turnkey solutions to wind power generators. It has licences from at least two international wind energy technology companies to manufacture WTGs. Renewable energy is a focus industry for the government. The recent budget, which doubled the coal cess for a clean energy fund, emphasised on achieving the 175,000 megawatt (MW) target for clean energy installations by 2022. In the nine months ended December 2014, Inox Wind produced and sold 190 WTGs, compared with 60 in the year ended March 2012. Revenue for the same period was ₹ 1,795 crore, as against ₹ 100 crore for the year ended March 2012. As of December 2014, the company had orders for WTGs with an aggregate capacity of 1,258MW. Bank of America Merrill Lynch, Yes Bank Ltd, Axis Capital Holdings Ltd and Edelweiss Financial Services Ltd were the advisors for the Inox Wind share sale.